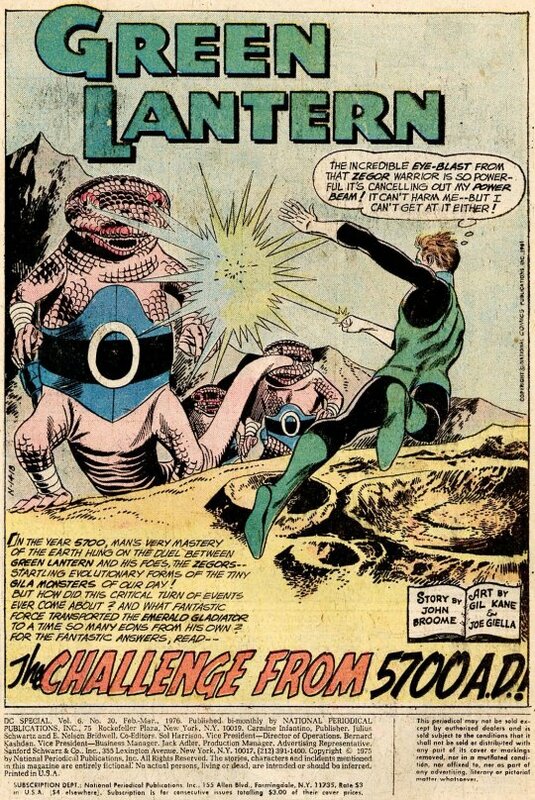 The next issue of DC SPECIAL was an all-Green Lantern extravaganza, the second (although I never saw the first) that helped to test the waters for the return of the Emerald Warrior’s own series in a few months. I loved this Mike Grell cover, so much so that my Mother sewed a needlepoint recreation of it that was displayed on my wall for many years. As you may have gathered, my weirdo Mom, who loved Star Trek and Star Wars and even today at age 75 plays Lord of the Rings Online, was pretty accommodating to all of this comic book stuff. It must be said, this was a terrific collection of early Green Lantern stories, combining the science fiction writing skills of John Broome, the adroit science fiction editing of Julie Schwartz and the masterful graphics of Gil Kane. I know Kane was less than enamored of the way he was held to a rigid house style in these days, to say nothing of the middle-of-the-road inking of Joe Giella, but I loved it all. 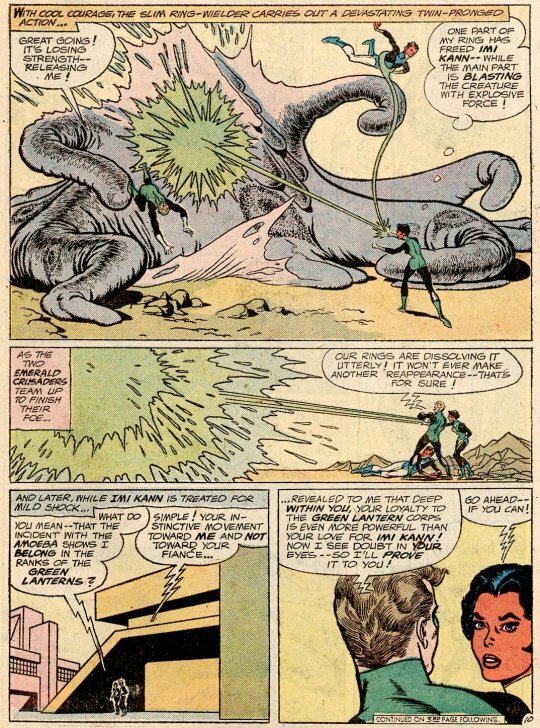 There was always a streamlined, classical beauty about his twice-up Green Lantern and Atom pages. The opening story is an amazing tale with the sort of off-the-wall development that you’d get in the early 60s Silver Age super hero stories. In teh year 5700, the Earth is facing a peril beyond its ability to deal with. Possessing no heroes of their own, they Science Council decides to pull Green Lantern from their own past in order to deal with the crisis. but because teh time dislocation will give him amnesia, they provide him with a future biography as Pol Manning, a deep space explorer. 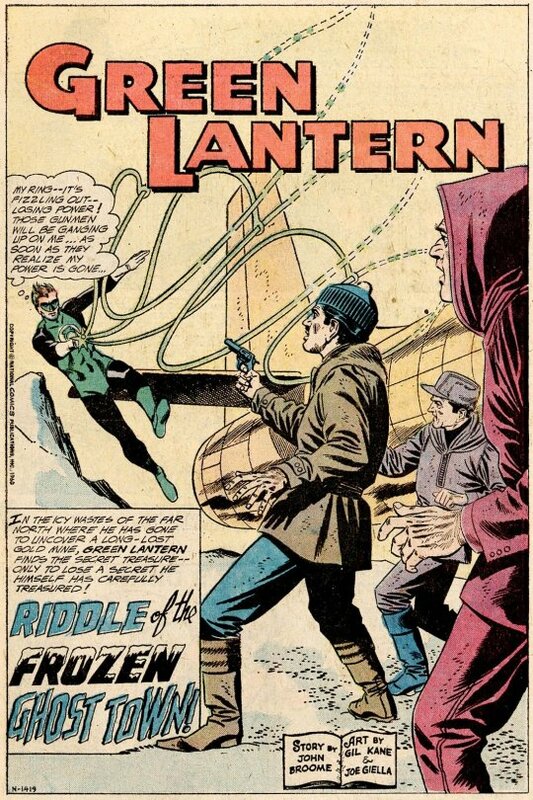 This set-up would be used a number of times over the years, with GL having a third identity that he himself knew nothing about–when he was returned to the present, he likewise forgot about his adventures in 5700, except for the odd clues that would slowly accumulate. The plot concerns Kalmaku quitting his job at Ferris Aircraft to return to Alaska, there to search for the other half of a map left to him by his father which will lead him to a gold vein buried in the mountains, which he can use to aid the impovershed citizens of his village. 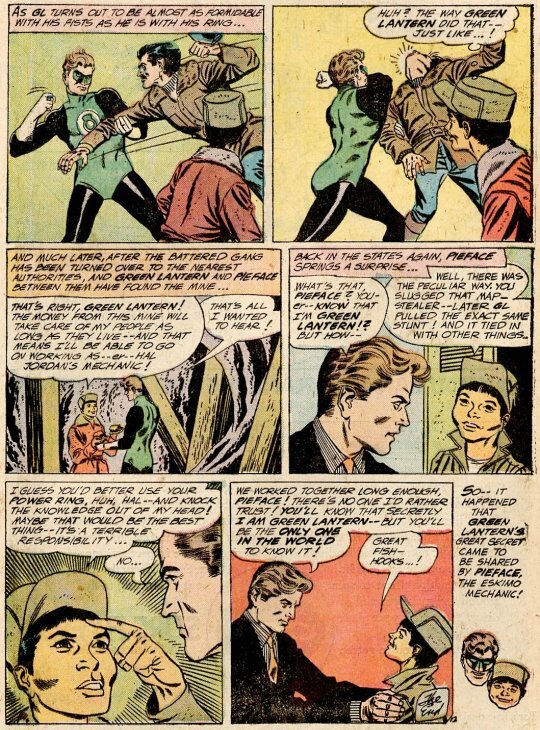 When criminals steal hsi half of the map, GL gets involved, and during the adventure, Kalmaku is sharp enough to put two and two together and work out that his test pilot friend Hal Jordan is secretly Green Lantern. He even asks GL to erase his knowledge of this fact, as it’s a dangerous responsibility, but GL takes him on as a confidant and partner. From racism, we segue to sexism, and also to the more dynamic inking of Sid Greene, whom Kane preferred. 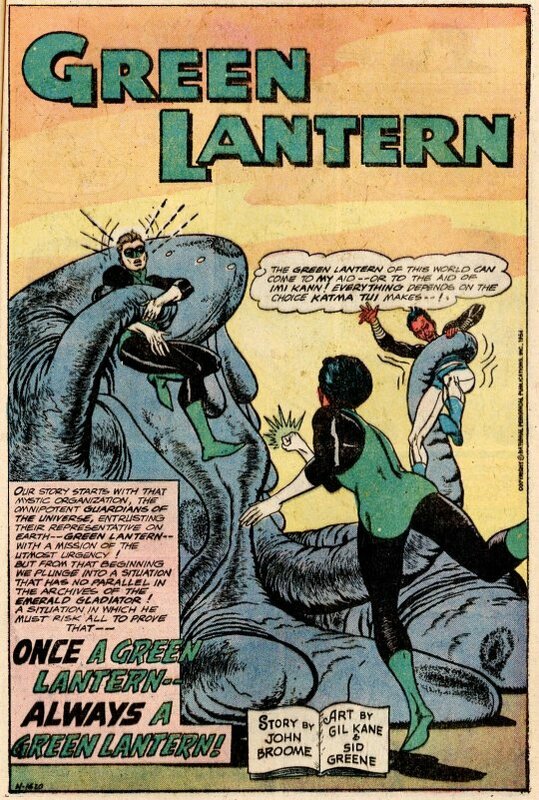 This story was the introduction of Katma Tui, the Green Lantern of Korugar who replaced the exiled and disgraced Sinestro as the ring-bearer of space sector 1417. But despite her stellar record, Katma Tui is determined tol eave the Green Lantern Corps in order to marry the man she loves (because of course a married woman can’t have a career as a space cop), and the Guardians recruit Hal Jordan as their agent to convince her to change her mind. This Jordan ultimately does by creating a mock-menace with his Power Ring that imperils both himself and Katma’s intended Imi Kann simultaneously. When Katma moves to rescue Hal first, it shows that her loyalty to the Green Lantern Corps is even stronger than her love for Imi Kann. And so, the happy couple is separated, and Katma Tui can get on with her duties in cold, lonely space. 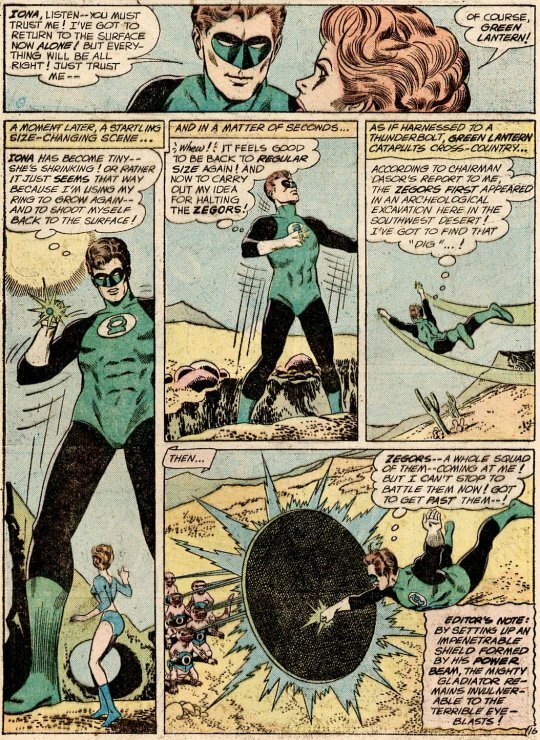 And on his way back home, Hal muses that the situation is analogous to his own with Carol Ferris–but since he is a man, perhaps he wouldn’t have to give up his GL career in order to marry her. Yeah, way to go, Hal!